NEW RELEASE! DSE HOW TO LATIN. SPECIAL FOR THE FULL SET FOR A LIMITED TIME ONLY! DanceSport Endurance® is a rigorous workout blending movements from the world’s most popular Ballroom and Latin dances. This fun fitness routine improves rhythm, strength, flexibility, and coordination! For a limited time, the 4-DVD DSE set is $34.95. For individual DVDs, the Original Workout 2-DVD set is $24.95; the How-To Ballroom is $17.95, and the newly released How-To Latin is $19.95! How-To Latin DVDs are in! Order your copy today. I will not rent out or copy these DVDs. I agree to never rent out or copy DSE DVDs.I disagree and plan to rent out and/or copy DSE DVDs. DSE is a great workout for any gym with members who love to dance, and it is also a great workout for the home, through the specialty DVD set only sold here and through Dance Vision. 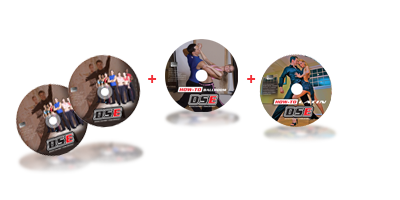 This specialty DVD is a unique product, made in America by the founder and creator of DanceSport Endurance. It allows the user to see dancers from behind and in front simultaneously in 13 different tracks. The workout contains 8 dances in a specially designed format to bring your heart rate up in two phases. It contains a COMBINED FRONTAL/REAR VIEW, which helps dancers to imitate the professional latin and ballroom dancers in the DVD! DanceSport Endurance brings a full spectrum program to you, your gym, and your friends and family. Todd Borzych created DSE in 2002. He is a professional dancer and aerobic instructor. In 2007, he began training other instructors to teach the program, and it is now held in specialty clubs and gyms where ballroom dancing and aerobics are treasured!